Aura is the latest pillar from Thierry Mugler (I know, I know, it's Mugler now, not Thierry Mugler, but my brain is not quite ready to make the switch). I have an ambivalent relationship with the brand's feminine pillar fragrances. Their debut fragrance, 1992's Angel, was a masterpiece, but not one I want to wear. I really like a few of the flankers, though, and have almost bought Angel Liqueur de Parfum any number of times. I thought Angel Eau Sucrée was fun and I thought Angel Muse was fantastic, but I didn't buy either of those either. The success of Angel is often attributed to its unusual (at the time) overdose of patchouli and candy; Alien followed in Angel's footsteps with an overdose of jasmine, vanilla and cashmeran. I did not love Alien but I didn't really hate it either. If I had found it more appealing than I did, I probably would have tried more of the flankers. Womanity (2010) broke with tradition, perhaps — it struck me as relatively subtle, and seemed to go for contrast rather than overdose. I found it likable if not as interesting as it should have been, and certainly not as interesting as Angel or Alien. It does not seem to have sold very well. The double overdose is supposed to be composed of tiger liana and rhubarb leaf (other notes: orange blossom, bourbon vanilla and wolfwood), and perfumers Daphné Bugey, Amandine Clerc Marie, Christophe Raynaud and Marie Salamagne have whipped up a green oriental that fulfills the excessive requirement, at least: Aura is loud. The opening is also unusual — it smells like a blend of camphorous toothpaste2 and tropical flowers, or more precisely, a perfume intended to evoke tropical flowers, since it has an overtly synthetic edge. Many reviewers mention the lovely note of rhubarb early on, but I hardly notice it until the toothpaste subsides a bit, then, yes, there is a fruity rhubarb, very green, very sharp, a little sour and a little tart. Maybe not an overdose, but it's there. And yes, there is a slight hint of smoke in the early dry down, along with a woody vanilla base. The smoke gathers intensity later on; while it never reaches alarming levels, the smoke and the camphor combine to keep Aura, which is otherwise sweet and a bit creamy, from qualifying as a foody / pudding comfort scent. Just as well, we've plenty of those already. The lasting power is amazing. You might want to try it on a blotter first. Verdict: Job well done. Aura doesn't smell like a dupe of anything else I can think of. 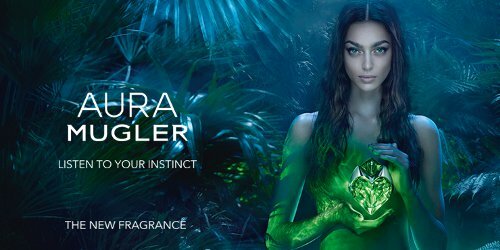 It's a good fit with the image of Zhenya Katava working her way through a neon-flecked jungle in the ad campaign, and it is just loud and odd and polarizing enough to seem like a good fit with the Mugler brand in general. To my mind, it's far easier to wear than Angel. Still, speaking for myself (and my wallet), no sale. I do like Aura better than Alien, and I found it far more daring and unusual than Womanity,4 but I didn't fall in love. I will be interested to see what they do with flankers, though, and I've taken so long to try Aura that there is probably already one on the way. If you've tried it, do comment! 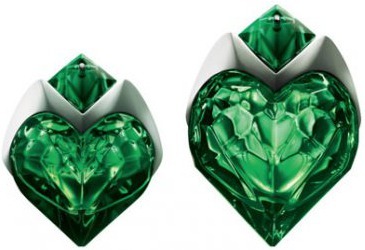 Thierry Mugler Aura is available in 30, 50 and 90 ml Eau de Parfum and in matching body products. 1. From the Mugler website. 2. The medicinal toothpaste smell reminds me of Ajona Stomaticum. 3. I also used this quote in the fragrance announcement and it originally came from Sunday World, but the article does not seem to be online. 4. Although I should add that that's not the universal take: The Candy Perfume Boy finds Aura the tamest of the lot. He does love it, though. I’m usually a big Mugler fan who wears Angel, Alien and a lot of flankers – and B*men. But this was horrid on me. I bought it unsniffed as soon as it launched and was totally unprepared for the cool menthol note that runs through the entire life of the scent. It really made me feel somewhat ill, so I sold it. Can totally see that! But at least you weren’t bored by it? No, not at all! It’s very interesting, and I love the bottle. I think that bottle is love-it-or-hate-it too, really seems to inspire strong opinions on both sides. I had heard Aura would be at Macy’s this summer, but that obviously didn’t happen — I don’t really know the story, hopefully someone else will chime in! I’m hit or miss on Mugler (I haaate OG Alien! ), but am very excited to try Aura! The opening sounds like a cousin of Covet but maybe that’s just wishful thinking. Maybe a sort of distant cousin? I find Aura weirder, and the weird parts of Covet didn’t really last that long into the scent — plus, the dry down of Covet is really (funnily enough) a spawn of Angel. I despise Angel, just despiiiiiiise it (that’s largely due to my Serious Patchouli Aversion) but don’t mind Alien despite its synthetic component. Hated Womanity (fig, ew), thought Cologne was interesting, and might see if I can try this. I kinda doubt my local store will stock it and I’d probably have to drive a couple of hours to find a tester. We’ll see. I checked Mugler’s US website, no Aura to be found? I wonder why it still hasn’t launched here. Did it not do well with test groups? I thought Mugler didn’t care about test groups…. So if you’re in the US, no way to try this. How did you find yours, Robin? Ack, I can’t remember! I’ve had it a couple months, and probably got it on eBay? That’s most likely since Clarins rarely sends me samples. I called Mugler U.S, and the representative told me she thought we would have it around December for the holiday’s. Thanks for the review Robin! I’m very excited to try it. I love Alien, and like Angel. Womanity, though, I, well, hated. Although, I haven’t smelled it since it first came out. I’m hoping I really like Aura, but I am concerned about the camphor smell. The rest of it sounds good to me. Do you like wintergreen? I think that’s the closest thing I can think of — the first time I smelled it, toothpaste was what came to mind right away, but later it also made me think a little of muscle rub. There’s definitely something medicinal about it. I’m definitely curious to at least smell this one. I don’t own anything from Mugler but appreciate that they don’t conform to what’s going on trend-wise. Your description of Aura is reminding me a little of Cacharel Eden in that weird, completely synthetic green-ness. Which also smelled wintergreenish to me, but more urinal cake than muscle rub. I came close to blind buying this a few times but the mention of wintergreen and toothpaste here and on other sites puts me off. Those are notes I do not like in my perfumes. However I am still eager to try this since Mugler always seems to have my attention. I would not blind buy this one unless they come out with a 10 ml spray or something! Mint has turned me off in a couple of other fragrances, but I’ll give this a sniff when it starts showing up here. Meanwhile, I am curious about the newer Les Exceptions: Wonder Bouquet, Hot Cologne, and Fougere Furieuse. I like Oriental Express, Supra Floral, and Over the Musk very much. Wait, Fougere Furieuse is in the original set. I guess I wasn’t bowled over by it. I don’t much care about Hot Cologne, but hearing good things about Wonder Bouquet and definitely want to try that one. Wonder Bouquet is very nice. It has a bit of a bready note in the opening, but it dries down to a slightly sweet powdery floral. I didn’t like Hot Cologne at all. I have a sample of this and when I first sprayed it on, It smelled very unique. But as it dried down I started to think that I’ve smelled this before. Then I realized that to me it smells very much like an edp version of Alien Sunessence Or d`Ambre. Which I like, because being an edp, this last’s longer than the edt. So yeah. Aha, that’s another one I did not try! Interesting if they used bits of it in Aura. Robin, may I ask you if you consider it unisex?, the notes sound like it. thanks. I tried it and found it just okay. Nothing offensive, but not swoon-worthy either. Then my skin decided to amp up the vanilla note pretty quickly. And it became a bit of a mess. Its the ugly kind of vanilla I cant handle, too sweet, too loud, too screechy. Maybe it was because of the hot weather but I could not wait to get home and scrub it off me. I think I am one of the few that really enjoys Womanity. I too am still waiting for Aura to appear and it is most definitely not in any department stores here Japan that I visited (this country is really discreet with scents!). I haven’t worn it in ages, but Womanity is my go to scent when I am cooking all day during the holidays. Almost that time of year again in the US. I, too, liked Womanity and adored the bottle. My adult daughter borrowed it and never returned it because she also liked the fragrance and had compliments. My second bottle was the taller one and now it’s empty and Womanity has been discontinued! Topical amusing story about a recent visit to Glasgow with my friend Marion, whom I’ve mentioned before as a relatively new convert to even being interested in fragrance in spite of herself, as opposed to sitting patiently with either a cuppa or a glass of something sparkling while I browse/discuss, due to years of visits to ‘smellies’ related venues! Our first day in Glasgow & a propos of nothing she says “Oh I found something I liked in an ad with a scent strip in a magazine the other week” – I ask “What was it?” – she replies (of course!) “I don’t remember & don’t ask me what it smells like cos I don’t remember that either!”. Eventually after some chat she comes up with the name Mugler (or a variation thereof!) so I march her straight to frasers department store & the Mugler counter. I must admit Angel put me off from the start, so I’ve not explored anything since. Sure enough, & with the help of a lovely sales lady, she identifies Aura. the following day is her birthday, & I’ve booked a fine dining restaurant as a surprise, though with no attendant birthday fuss, as that’s not her way, so I manage to sneak off while she’s chatting to a sales person in another shop & almost manage to complete the purchase of a (refillable – hurrah!) bottle of Aura before I realise she’s practically behind me. She asks what I’m doing & I shrug it off, but she knows that I know that she knows! Anyway, we go about our cultural & foodie adventures & I give her the bottle when we get back to our hotel, with the observation that even with my strong powers of persuasion, I knew she’d never go back & buy it for herself. She’s delighted of course, & even more so when I tell her it refillable (thank you to the charming lady in the shop for stressing that to me). We also thoroughly enjoyed dinner that evening – everything we ate was topnotch, & the starters & puddings were works of art on a plate! That’s so sweet! Do you have any perfume-smelling advice for folks visiting Glasgow (or Edinburgh)? Katrina, Harvey Nicks in Edinburgh used to be much better than it is now, Jenners there may also be worth a look, plus there are branches of standard higher end ‘h’gh street’ shops (except they’re not standard in Aberdeen where I live!) such as Penhaligons, Space NK& Jo Malone – but seemingly very short on independents or niche standalone shops; Glasgow much the same, although Penhaligons there closed some years ago – Frasers is SO much better than it used to be, however, so would definitely recommend it – Margiela & Atkinson being two of their more recent offerings, & the lovely chap I spoke to about Margiela last month (having bought some last year & been given a good few samples) said they’re expanding their range of this brand. Hope this helps. Thanks so very much; that is helpful! I am so looking forward to visiting Scotland and always want to include a good perfume destination wherever I go! You’re most welcome. As ever in the UK, London is of course your best bet for really good fragrance shopping. A few years ago when visiting our friends near The Woodlands, Texas, I remember going into Houston city proper to find a shop whose website promised all sorts of different things fragrance-wise, & when we got there it seemed the bulk of their offerings were crammed on to a couple of shelf units – husband not impressed with 80 mile round trip for not very much result! Oh, thanks so much for sharing that story — you are a good friend! Not wanting to blow my own trumpet, but I’m sure you’ll appreciate this Robin, I sent my friend a link to a Fragrantica article about a Mugler ‘atelier’ opening within a high end department store in Paris which also stated Aura was already an iconic (!- I know, don’t shoot the messenger!) fragrance & told her well done on choosing so well, & she came back with “I had a good teacher”, bless her! Great review, Robin. Have not seen Aura in stores yet, but am interested in smelling it. I own and love Alien, and receive many complements when wearing it. While, I appreciate Angel and Angel Muse for being unique gourmands. Also, can we just talk about that bottle? It is looks so fun and gorgeous. Like a great companion to the Angel and Alien ones. I actually bought a 30ml bottle of this yesterday in the Black Friday Sale at Debenhams I couldn’t resist! I already wear Angel occasionally for some nights out/ parties, and less often Alien through the day (both of them all year round). I liked Aura instantly and it went on my “to buy” list right away. I’m a huge fan of Thierry Mugler, both his perfume and his fashion. so naturally I was excited for its release. Aura reminds me a little bit of Aqua Di Gioia by Armani which is minty and wet. whereas Aura is rhubarb, green and wet. they “feel” similar rather than smell similar. Sampled it 5 mins ago and need to was it of ASAP!! No wintergreen. No rhubarb. Call 911. I first smelled this in a magazine ad. I thought it was so odd-smelling. I made my mom smell it and she agreed. I couldn’t stop thinking about it, though. I pulled the trigger and bought the 3.4oz. bottle. I’m thrilled I did. Make no mistake, it smells weird. The only way I can describe it is a bouquet of night-blooming lilies being placed in a bowl of the most expensive vanilla bean ice cream. At midnight. It never fails to get compliments when I’m wearing it, and I think it’s so strange that people feel like they MUST ask what I’m wearing. For me the bottle is also a 10/10. I keep it in my purse and people definitely notice when I pull out a reptile-green-and-chrome heart. I think this smells exactly like Joop! Femme by Joop! I smelled a test strip from a Macy’s catalog today and was taken back almost 30 years in an instant. New to this forum! I’m a perfume addict and a perfume executive over a few large, prestige brands and have been working with perfume for the past few years (I come from a cosmetics background) I hate all of the other muglier scents…but this one I had a whiff of in a magazine and was instantly intrigued. It didn’t smell like anything I have come across. On my way home from Denmark they had it in duty free so I bought a bottle and wore it today…so many compliments. People loved it and I love how it wears on me. Medicinal yet…feminine. This will be in rotation.